We're sorry; this specific copy is no longer available. Here are our closest matches for Co-trending: A Statistical System Analysis of Economic Trends by Hatanaka, M., Yamada, H.. In macro-econometrics more attention needs to be paid to the relationships among deterministic trends of different variables, or co-trending, especially when economic growth is of concern. The number of relationships, i.e., the co-trending rank, plays an important role in evaluating the veracity of propositions, particularly relating to the Japanese economic growth in view of the structural changes involved within it. This book demonstrates how to determine the co-trending rank from a given set of time series data for different variables. At the same time, the method determines how many of the co-trending relations also represent cointegrations. This enables us to perform statistical inference on the parameters of relations among the deterministic trends. 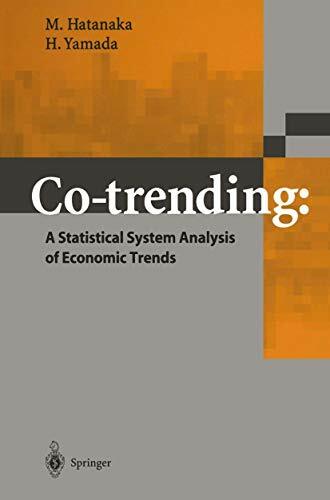 Co-trending is an important contribution to the fields of econometric methods, macroeconomics, and time series analyses.